Nothin’ like traveling to get the old hunger going. College towns are often chock full of interesting restaurants, and Morgantown, home of West Virginia University, is no exception. Here’s some places to check out if you find yourself in the land of the Mountaineers with a growling stomach. Farther down in the same shopping center, Pies and Pints blew us away! A very nice waitress, a full beer selection (I chose new favorite Rogue Chocolate Stout) and an appetizer of rosemary and roasted garlic bread with goat cheese put me in a great mood right from the start. The pizza – a large with half Cuban pork, half gouda – was just the icing on a ridiculously delicious cake. By the time we got to our layered peanut butter and chocolate parfait dessert, I was about ready to track down the owner of this chain and beg that person to open up a place in the DC area. If you’re reading this kind sir or madam, know that Washingtonians are ALL about the craft beer and pizza – and your selections would blow us away! Kenyan Cafe may have been my first taste of Kenyan food. How delicious it was! A wide variety of hot drinks (such as the spicy Masala tea and comforting millet drink), appetizers/sides like the beef samosas, and very generous entree portions – check out one of the hearty stews – make this a great place to check out for some quiet time over one of the local newspapers or with your laptop (free Wi-Fi!). Desserts include vanilla ice cream with fried plantains and cinnamon, and the Mount Kilimanjaro (sweet mandazi bread with the cinnamon-vanilla ice cream and bananas) – both very tasty. Don’t leave without a bottle of Kenyan Cafe’s Wild Kenyan Hot Sauce – if you like spicy, you are in for one hell of a treat. Other places worth a taste include the Los Mariachis Mexican restaurant – prepare to become very full, very fast from the hearty fare – and Peking House, a super cheap and super fast sit-down Chinese joint nearby with big portions for the small price! 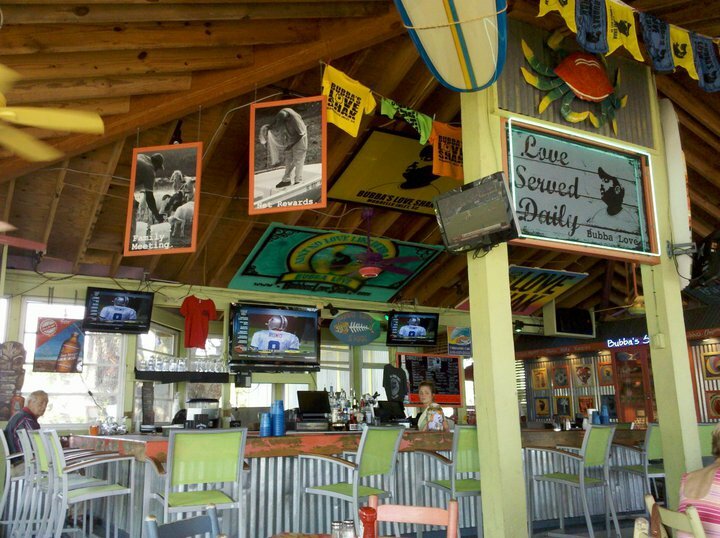 Speaking of growling stomachs … one place we never hit up was Black Bear Burritos. (Get it? Bears? Growling? Ha … ha …) With two different locations, there’s really no excuse (so shame on us). We’ll definitely check it out next time because this place sounds fantastic! Oh, and what did we do for breakfast each morning? The Euro-Suites Hotel provided a great full breakfast in the mornings (and appetizers like chips and salsa, meatballs, and veggies and dip for happy hour at the bar/lounge night – although we were always too full from dinner to partake!). 405 8th St. NW, DC (formerly Café Atlantico space). 202-393-0812. www.americaeatstavern.com. Brunch, lunch, dinner, pre-theatre, cocktail/oyster hour. Before I can get back to my travelogues, I have to give you a special emergency restaurant recommendation. Why emergency? Because it’s scheduled to close on July 4th of this year after completing its planned one-year run! America Eats Tavern, owned by famed Spanish chef José Andrés (who also owns Oyamel, Café Atlantico, Zaytinya, and Jaleo, among many others), first opened last summer – on July 4th, natch. It’s named after the Works Progress Administration (WPA) writer’s project of the 1930s, which sent out-of-work writers across the country to research the regional cuisine of various areas. Andres moved Café Atlantico to make room for this concept eatery, whose menu showcases creative takes on beloved American food and drink, as well as “long forgotten” fare. During the run of last summer’s fabulous “What’s Cooking, Uncle Sam?” food advertisement/history exhibit at the National Archives – for which the revered chef was the Chief Culinary Advisor – all of the Tavern’s profits were donated to The Foundation for the National Archives. Eric and I visited around cherry blossom season and were happy to recognize some classic vintage ad prints for “vitamin donuts” and the like visible inside the tavern’s gracious three-story space. The first floor is for casual tavern dining, while the second and third floors offer the fancy stuff. Our host brought us all the way up to the top floor, where we sat right next to the balcony railing and had a spectacular view of a very creative mobile – a “scrapbook chandelier” – made out of windows and black-and-white photos (all featured in the Archives exhibit). The service at America Eats was spectacular. All of our servers were about as attentive and friendly as it gets, but not so much so that we couldn’t take a bite without being interrupted. More difficult was the menu itself – there were so many cocktails and foods to try that we had no idea where to begin. Our main server had mentioned the three tasting menus, so we decided to take a look at those and ultimately decided upon the Mary Randolph ($65/person). (Mary Randolph, explained the menu, was essentially the 19th century Martha Stewart.) While we waited for our first course, we ordered cocktails from the Colonial age section of the menu – a switchel for Eric, and a cherry bounce for myself. The switchel, a “field worker’s drink from New England”, came in a Mason jar and consisted of rum, cider vinegar, molasses and ginger. It had quite the bite, and Eric was less than enthused at first, but it grew on both of us. The cherry bounce, on the other hand, won me over immediately. A favorite of our first First Lady Martha Washington’s, the tall frosty glass contained sour cherries soaked in rye, gin, lime, vanilla, and bitters. I could’ve had another one or five of these, but instead I made my next drink the Sherry Cobbler, a mix of Amontillado Sherry, orange and sugar showcased in a gleaming tin cup with a heap of crushed ice and a matching tin straw! (The menu explained the straw was a “new fangled invention” in the Colonial age.) The Cobbler couldn’t match the perfect spring heaven of the Bounce, but it was not for lack of trying. As for the food … where do I begin? Our seven-course meal came in small, artfully presented tasting portions so that we weren’t too full to savor each new dish. (Here I should note that selections on each tasting menu are subject to change, so you aren’t likely to get the same selections each time.) Our server helpfully explained each selection as it arrived. Sorghum Butter Hush Puppies. This may have been my favorite dish of the evening, with its insides so perfectly buttery they melted right in my mouth. The sweet melty molasses taste of the sorghum butter made it a fluffy heaven. I almost fell over with joy right there. This was going to be a great night. Oysters – super slick and buttery, they came right out of the shell and were easy to savor. Boneless Fried Chicken and two ketchups. Imagine perfectly juicy insides and delightfully light and crispy big cornflakes on the outside, and two delightfully strange ketchups to try. Even better, the chicken comes served in a little paper sack “dish”. Waldorf Salad. Just the right amount of dressing and crisp rounds of apple. Shrimp and Grits. The grits were the perfect consistency to me – textured, not too creamy. Bacon and chives rounded it out … mmmm. Oh sorry, I was getting distracted by the memory and floating off into foodie heaven again! Eisenhower Stew. Named for the president of whom it was a favorite, this pile of perfectly cooked beef, potatoes, carrots, onions, and tomatoes arranged on a plate with just a little bit of beef stock isn’t very stew-like, but it sure is tasty. Perfect for a fall day. Barbecue Beef Short Ribs. The meat fell right off the bone. Cheesecake. Not super sugary, this “cake” had the consistency of mousse and sat atop a nice crumbly cookie “crust.” A creative spin on my favorite dessert! The hush puppies with sorghum butter were far and away my favorite, whereas Eric loved the Waldorf salad best of all. 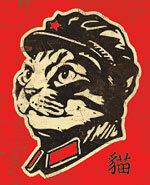 Did you miss the National Archive exhibit? Check out the companion book, Eating with Uncle Sam. And read more about America Eats Tavern and Chef Andrés in this Washington Post article from July 2011! Sauca: New Restaurant on Columbia Pike Is Worth a Trip! One of my favorite things about living on the Pike is the many great local businesses we have within walking distance. We have great American joints like Bob & Edith’s and The Broiler, and a slew of international options. Why, within a couple of blocks from my building I can find at least four Thai, three Chinese, and two Ethiopian eateries, plus Irish, Japanese, Mexican, Salvadorian, Turkish, and Afghan. Now to add to all that, we have the showcase of international foods called Sauca. Sauca is a little farther down the street at 4707 Columbia Pike. This location doesn’t have the best history of holding down businesses. When I moved here nearly 4 years ago, it was the home of Bob & Edith’s II, which soon closed. Later it was a pollo chicken shop with a check cashing place attached, also short-lived. Most often I saw it vacant. But Sauca, already well-known thanks to its food truck business in the District, is already attracting much buzz. Eric took me over there a few nights ago to check it out. After moments of indecision over whether we’d sit indoors or out, I ultimately chose indoors. (It was just too hot, even with the ceiling fan on the patio.) The selections at Sauca include a wide variety of “saucas” or wraps with ingredients inspired from around the world. Get a combo with a drink and a side of your choice if you like. Eric ordered the Mumbai Butter Chicken sauca with yucca fries and I had the Medi Veggie with curried potato salad. (Not exactly adhering to my diet — oops) Lemon aoli was served with the fries and then the nice owner/manager (I presume) came around and offered us a couple of hot sauces. He gave us a spicy green sauce and a sweet hot sauce which was especially delicious! The yucca fries, which are big, light, and soft with slightly crispy outsides, were gone in no time. So how was the rest of our food? Eric’s Mumbai Chicken was soft with basmati rice, cashews, and sweetly seasoned chicken. It was a tad light on flavor for my taste, but I would eat it again. My Medi Veggie was so good that I almost ate all of it before I realized I was about to die of being overstuffed. It had hummus, saffron rice, Kalamata olives, tomatoes, and a dill yogurt sauce. Another vegetarian wrap option is also available. I thought my potato salad could have done with far more curry; it was good but was too close to plain old potato salad for me. I would highly recommend Sauca whether you track down the food truck or journey out to their sit-down eatery. The food is great and you have your choice of a variety of wraps representing several different world regions. I can’t wait to go back and try another sauca! But how do you say it? I think it’s pronounced “sow-cha” – I’ll ask next time I’m in there. It’s not every Sunday afternoon that I wake up to someone jumping up and down on the bed yelling, “MARTHA WAKE UP! MARTHA WAKE UP! I want to take you to a restaurant!” I was willing to forgive this intrusion as the offender was very handsome … oh yeah, and that he was offering to pay for my lunch! I had passed Cactus Cantina on my way to Bethesda the previous weekend, of which I know my sister is a big fan, so Eric and I headed out that way to enjoy his first full day off in … let’s not get into that. It’s at 3300 Wisconsin Avenue NW, a relatively short drive from our home. As we turned onto Wisconsin from 33rd Street, Eric got the bright idea to park a full mile away from the restaurant so that we could walk off some of the excess calories in advance and enjoy the weather. I should’ve considered my shoddy footwear choice (my favorite purple flats) before I agreed to this plan, but I didn’t and I’ll spare you the details of what ultimately happened to my poor little feet. Other than those injuries, it was a lovely walk and we even got hit with a brief refreshing summer shower! The Cantina is hard to miss, with attractive decor including a large cactus statue with neon lights. Inside, the atmosphere was lively and the service was pretty fast, not surprising considering the number of waitstaff to patrons. There had to be a server for every single person (not table) in that whole joint, and they were all dressed like camp counselors! Awesome! We were seated next to the tortilla maker and given chips and salsa. The chips were delicious but the type that break easily, and the salsa was the watery kind that drips all over you unless you hold the bowl right under your face as you eat. This never stops us from devouring a whole basket, however, and it sure didn’t this time. We also had a plate of jalapeno queso dip, guacamole, and shredded cheese with our pre-meal munchies – DELICIOUS. When our main brunch dishes arrived, I was already close to full. I do this EVERY SINGLE TIME I visit a Mexican restaurant and ruin my appetite with the snacks and appetizers! I managed to eat one of my three fish tacos anyway and I drained most of my frozen peach margarita. The drink could’ve been stronger – but I really don’t drink that much anymore, so if it was stronger it probably would’ve put me to sleep for the afternoon, haha. Eric complained he was stuffed but demolished his giant burrito anyway … no surprise there. It was a nice meal in a lively place. I have no real complaints. I’d like to come back. After we were through, we hiked back down to the car, stopping in Whole Foods on the way. The air was yummily warm and we watched a baseball team practice for a bit. If it wasn’t for our overly full states and my bloody feet, we probably would’ve hung around the neighborhood longer. What a good way to start a new week, especially after this last one was so … WEIRD. (Except for Saturday night; Saturday night was great) If I never have another week like last week ever again, that’s fine by me! Eric and I recently made two visits to the new District Taco out on US 29 in Arlington. Originally operated out of a little food cart, the business became extremely popular as it alternated days in Rosslyn and Crystal City. Sadly, my work very rarely takes me to either one of those neighborhoods during the day, but I read all about it online and in the Washington City Paper, and was eager to try. So when I heard that District Taco had opened a brick-and-mortar place out on Lee Highway, I was game. Owned by Osiris Hoil and Marc Wallace, this fun atmosphere takes your order quickly and servers call out the Spanish version of your name. (Martha = Marta, Eric = Enrique, etc.) Tacos and burritos come with your choice of meat and then three additional toppings, some of which cost extra. There is also a salsa bar included that you can use at your leisure. On our first visit Eric got three tacos packed with vegetables and I had the barbacoa burrito. We also ordered tortilla chips and salsa. That burrito was HUGE. I could barely eat half of it! But it was definitely delicious. Eric fondly said “These are just like Mom makes.” The downside was that both of our orders had been mixed up. Eric was not given the right type of meat, and my order was missing the chorizo I had requested as an “extra.” (The burrito was so gigantic I thought it might just be in the middle of it, but it wasn’t.) The tortilla chips came in a big paper bag and were warm and crunchy, and the accompanying salsa was in a generous-size tub and was not the chunky kind. I would say the chips and salsa are well worth the nearly $5 price tag. The soda fountain offers delicious Boylan’s soda varieties, made with real cane sugar, such as birch beer and black cherry soda. We were very satisfied other than the main food mix-up, which, to be fair, neither of us brought to the attention of the restaurant staff, so they did not have an opportunity to make it right. Our second visit was much better. Our orders were filled correctly and we both noticed someone like a manager or owner (perhaps Hoil himself?) supervising the food assembly line very closely and calling out instructions or corrections to the workers. Hoil is also known for responding directly to customers’ reviews online, particularly those critical of the new business and the way it is run. (Remember that they are still transitioning from running a food cart to running a restaurant and there may still be some kinks to iron out.) I support local business all the way and I am impressed by the owners’ dedication to their version of the American dream. Way to go District Taco, I am a new loyal customer! You can read more about Hoil, Wallace, and team and the new District Taco restaurant in this Washington City Paper article. Although the article compares District Taco to Chipotle, I personally think there is a world of difference and find District Taco the more flavorful of the two. Take a look at the official District Taco website. Pesce is an interesting pick for casual fine dining in D.C. On a recent trip to Dupont Circle, some friends and I wound up drifting across the street to Pesce after crowd favorite Pizzeria Paradiso was jam-packed and we were too hungry. Silly us, we glanced at the menu board out front and decided the prices were decent at 12 bucks and up for the entrees. Oooops … those were the appetizer prices! The waiter puts the board on a chair by your table and that’s how you see your selections … very interesting. I ordered two little crab cakes which met with my standards – juicy lump crab with minimal breading – and two desserts. A scoop of luscious hazelnut-biscotti ice cream went well with the very rich guayaquil chocolate tart. Pesce is located at 2002 P Street NW. Archa Thai (2311 Wilson Boulevard) is a delicious delivery standby but I have never visited their restaurant. I need to do that one of these days! My favorites are all there and they’re perfect: Thai iced tea, green curry, drunken noodle, and chicken satay! They also offer nice fresh salads. Fire Works is a new one, or at least it was a few months ago! Brick-oven pizza, tomato soup with gouda mousse, and a beer list a mile long make this a winner in my eyes. The atmosphere is casual and trendy and the bar fills quickly with young professional happy hour go’ers, so don’t expect it to be a nice quiet dinnertime joint. Find it at 2350 Clarendon Boulevard. For a great sub from a smaller chain with a cause, swing by a Firehouse Subs, founded and owned by firefighters. On a recent trip to Fredericksburg to drop off a loan check and have some fun, Eric and I stopped by one in the Southpoint complex in Massaponax. The main reason I wanted to try it is because I simply hadn’t before. The sub menu was very attractive. You don’t see your meal made in front of you a la Subway, but you do have many options, although I would prefer more fresh veggies on the menu. Choose a combo, and get a bag of chips and a fountain drink. You can pick white or wheat bread and add “fully loaded” if you like which comes with mayo, mustard, pickle, lettuce, onion, and tomatoes. The servers were extremely friendly and the walls were decorated with fire hats and coats. Our fountain drink cups had different firefighter bios on them. But the highlight of the day was what we saw when we walked in: a very long row of hot sauce bottles! Eric and I were so excited. I had a raspberry jalapeno that was not spicy at all, just sweet (eh) and Eric grabbed a Rhino peri-peri that was mild but still tasted like flames compared to what I wound up with! We also added some good old Tabasco. The closest location to Arlington is at 5900 Kingstowne Towne Center in Alexandria; other locations include Fairfax Towne Center and Sudley Road in Manassas. You can read the full Firehouse Subs story here and learn about the Firehouse Subs Public Safety Foundation here. September has reached its end, and the colder air of October is here. 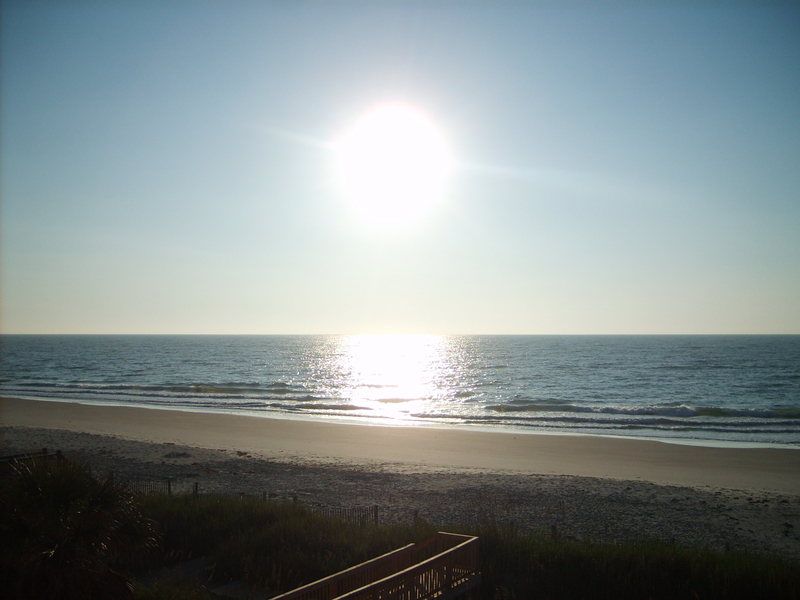 We just had our annual family beach week a couple of weeks ago to enjoy the last of the truly sunny days. This year we headed to an oceanfront house in Murrells Inlet, an unincorporated town in South Carolina’s Georgetown County. Although I’d never been to Murrells Inlet itself, I’m very familiar with the general area. 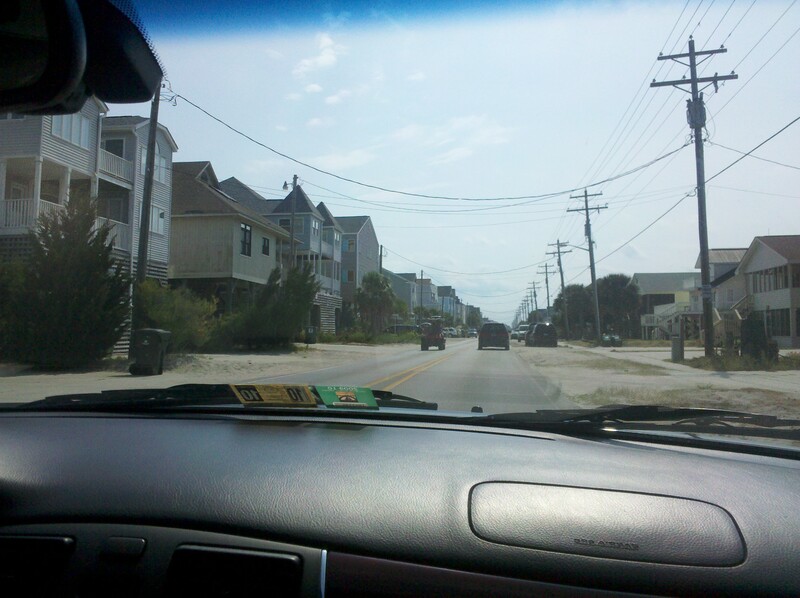 I’ve vacationed in the nearby Grand Strand cities of Myrtle Beach and North Myrtle Beach at least seven times. My sister had recommended Murrells Inlet to us, and it did not disappoint. It was beautiful, fun, and very easy to get around. I appreciated how the general September atmosphere was calm and collected. Sometimes you just don’t want a crowd. The beaches, lined mostly with houses on stilts, lacked the overly busy atmosphere of Myrtle Beach, but there was never a lack of things to do. 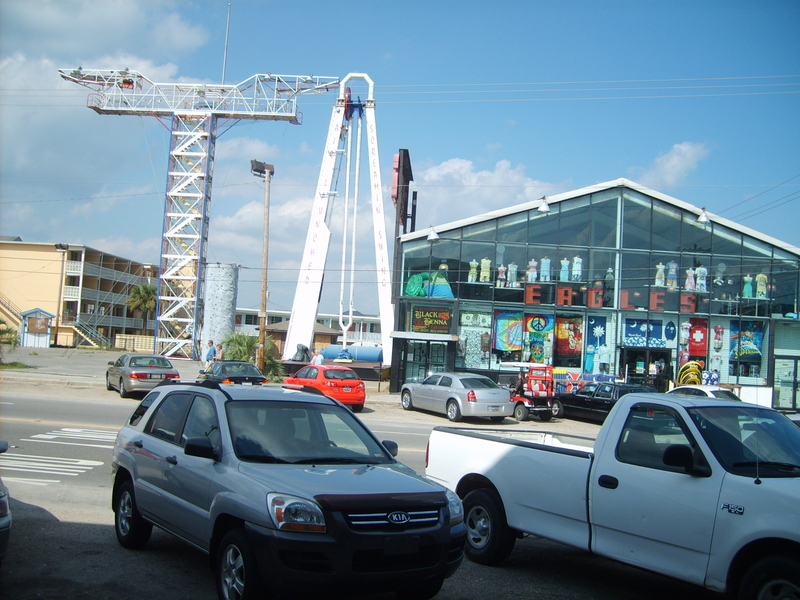 While I saw many a boarded-up business – a stark reminder of the recession – the Grand Strand is still a vibrant area where boredom seems impossible. On Waccamaw Drive. The beach is on the left! At the corner of Waccamaw Drive and Atlantic Avenue, you’ll find a small touristy crossroads with a dash of local thrown in. Here you are no longer in Murrells Inlet, but Garden City – an area of Horry (pronounced “OH-ree”) County. Eric and I walked all the way up there one day and it was quite the hike. At one side of the crossroads, you’ll see a very small amusement park called Slick Track, which looks abandoned, and a large beach supply chain store called Eagles. Stores like Eagles, Wings, Pacific, and Shell City are EVERYWHERE in this area! 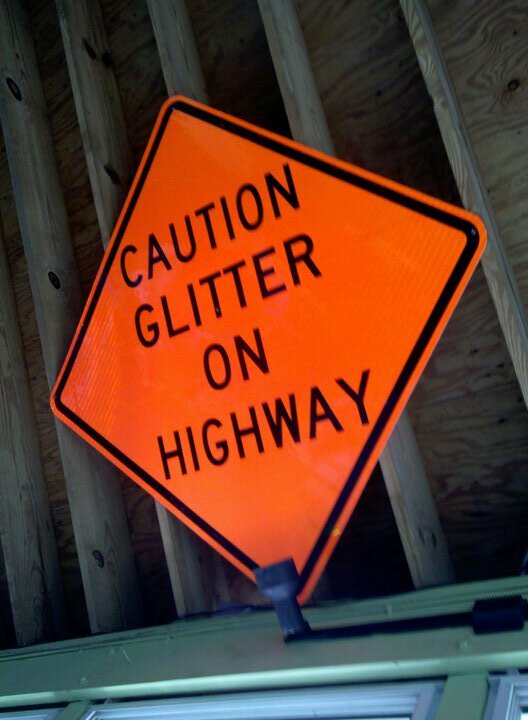 Use them to stock up on your rafts, swimsuits, towels and fireworks! (We did!) However, the animal advocate in me would like to kindly discourage you from purchasing hermit crabs with painted shells – the paint can be very harmful to the little crabs and even kill them in a painful way. Not to mention it just looks gaudy and undignified! Directly across Atlantic Avenue is a little row of shops with Sam’s Corner, the Pavilion arcade (or “distribution center” … haha), a tiny grocery store, and more. Sam's Corner is on the left. Sam’s Corner, to the far left in the above picture, boasted signs for 5 cent coffee and “world famous hot dogs” so Eric and I tested their claims a couple of times. The inside of this diner was comfortable and friendly and we struck up a conversation with one of the workers while we were there, who teased us in a good-natured manner. (Perhaps Sam himself?) I had a dog with chili and jalapenos and it was indeed delicious, although it can’t compare to a Weenie Beenie half-smoke. (But can anything?) I was disappointed that they didn’t offer free refills on the sodas. The prices were a little high all around, which I think one should expect in a beach town. I thought the 5 cent coffee was surprisingly good. They also serve cocktails and beer including one called “Hugo Revenge”. (Hurricane Hugo hit the town very hard in 1989.) I tried their El Paso sandwich for breakfast one day, which was a grilled pimento cheese sandwich with bacon and jalapenos. Who would’ve thought slapping these ingredients together would produce something so tasty? My verdict on Sam’s is that it’s a cool hangout with some yummy grub for a quick bite or midnight snack, and I want to eat there again. It only accepts cash, so be forewarned. 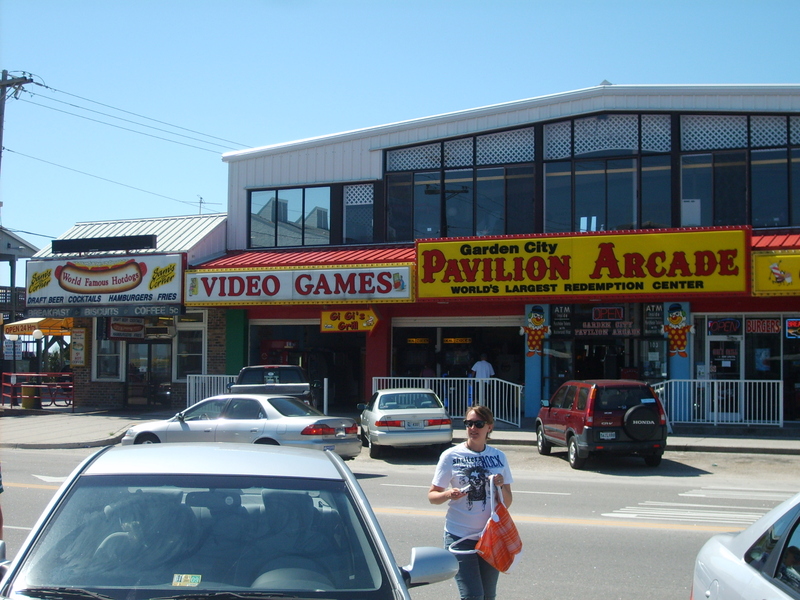 The Pavilion arcade was exactly what all kids of the 80s used to run around in on any Grand Strand vacation worth its salt. They have every cheesy, silly game you’d imagine with the requisite tokens required to play each game, and the tickets that you redeem for little el cheap-o prizes. Yes! Eric and I shelled out way too many dollars to knock out a dumb metal horse’s teeth, engage in a Wild West shootout, play skeeball, zap some crickets with a lizard’s tongue, and team up to fight off giant flies and spiders on a jungle adventure gone wrong. If you want to get drinks and/or ice cream, you can traipse across the street to Painter’s Ice Cream, and the Pier at Garden City, both on Waccamaw Drive. 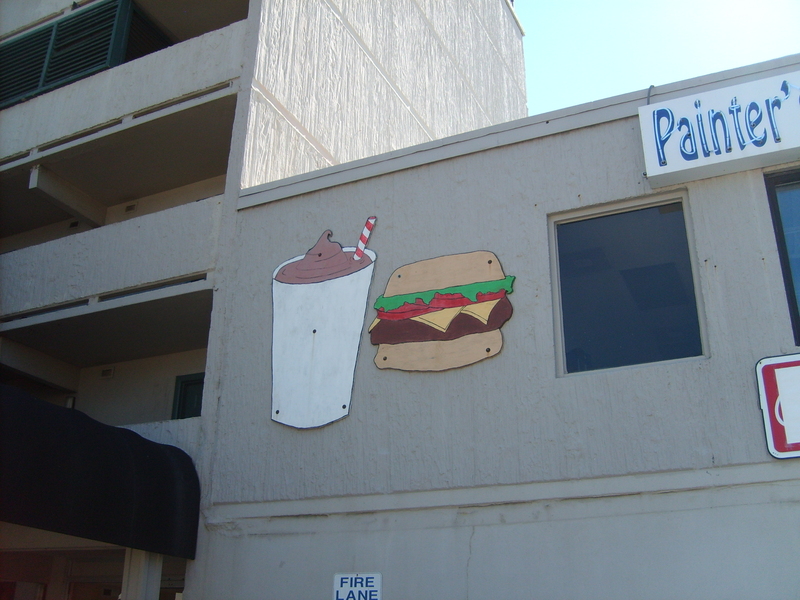 Painter’s, sadly, was closed when we had the chance to go there, so I can’t vouch for it, but the handmade signs are cool. Yes, sharks! 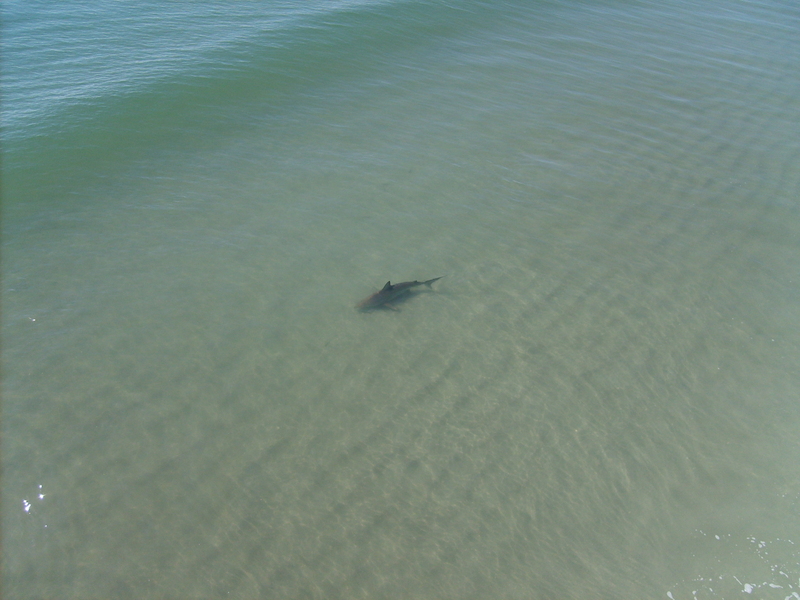 As we stared into the water, we saw no less than four – two blacktips, and two sand tiger sharks. I can’t even tell you how incredible it is to see such a powerful animal up close in the wild like this. The big swimmers devoured fish left and right and one even chomped the bait right off a lady’s line, taking the line with it. We had a clear view of them the entire time. At one point, a sand tiger was several yards away from a woman combing the shore all the way down at the beginning of the pier, but he showed zero interest in her or any other swimmers. He was merely circling to check out the fish selection. While I wouldn’t recommend throwing yourself into the water to hang out with these creatures, seeing their natural behavior is amazing. I never remembered the Myrtle Beach area as having much wildlife, but we certainly saw plenty! Gangs of brown pelicans were a constant presence. They really are such magnificent birds. We saw pelicans, terns, seagulls, and sea hawks fishing out of the ocean on multiple occasions. They had a smorgasbord to choose from – huge schools of fish regularly went by. The schools were easy to spot as they looked like dark shadows in an otherwise sparkling sea, with silvery scaly bodies regularly leaping up into the air. It was also not rare to spy a pod of dolphins or some other set of porpoises bobbing in the waves several yards from shore. While in the sea itself, it was very common to see many fish in the breaking waves, and groups of sandy-colored bottom feeders blending in with the ocean floor. Eric thought these “bottom feeders” might in fact be baby sand sharks, which doesn’t seem impossible! We didn’t encounter any jellyfish on our vacation, but something did give my foot a slight scratch or nibble in the ocean. I wasn’t concerned. It was probably one of the many crabs we came across. 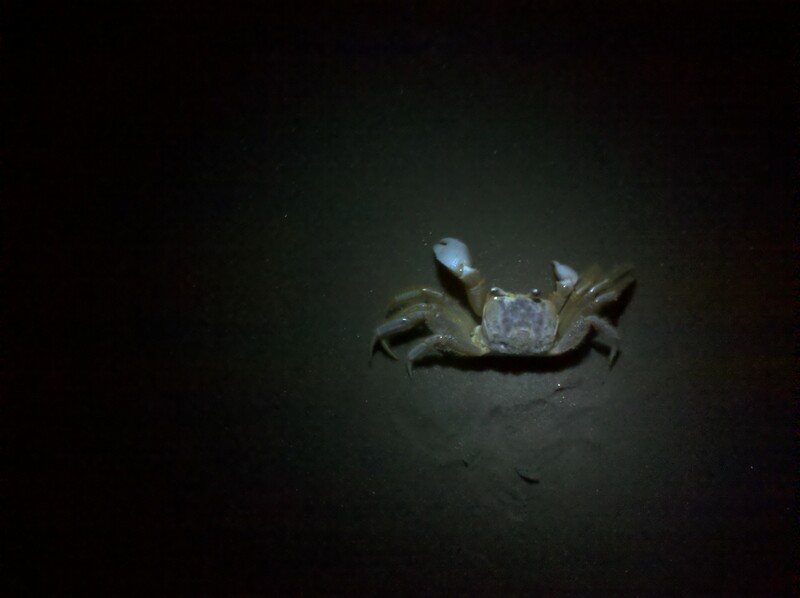 Ghost crabs were not as plentiful at night as they were at Hilton Head, but they were definitely out and about. We were a little alarmed to find so many dead ones, however, including three within very close proximity to one another with no noticeable signs of trauma. Some of the live ones we saw were quite large. We found one with a fish he had just caught, and caught others in the middle of digging their burrows. 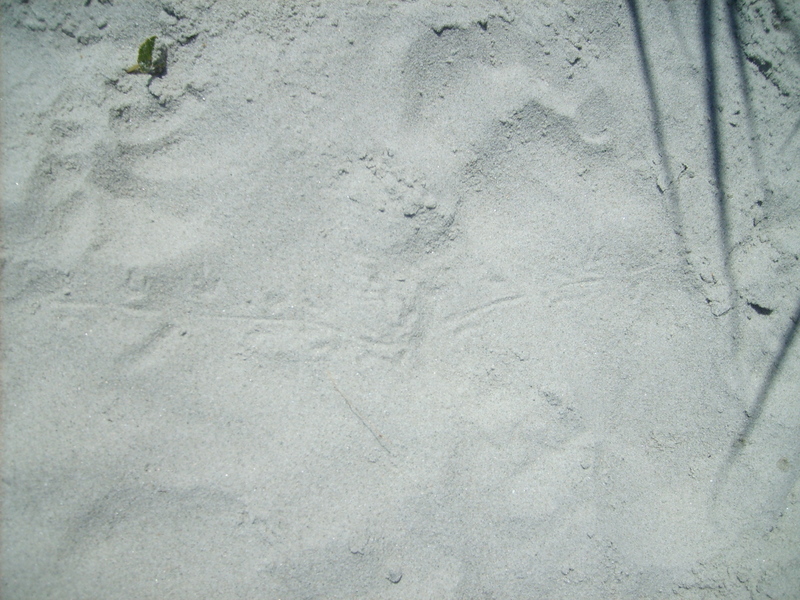 In the morning, crab clawprints dotted the sand. Little lizards and skinks inhabit the sea oats and grass. A pair of skinks regularly ran back and forth across the path as I approached. I don’t know what they were up to, but they left neat tracks behind. Lizard tracks. You can see where the lizard's tail dragged along on the ground behind him. Eric, admiring the gorgeous sun-sparkled sea, encouraged me to take a beach walk with him every morning. It was very difficult for me to rise out of bed at such an early hour, but the smell of Daddy’s multi-grain pancakes helped. On a couple of these morning beach strolls, we came across a couple of big light brown crabs with white spots, which my wildlife book identified as speckled crabs. We saw one such fella right where the waves broke one morning. He made it clear that he did not appreciate our peering at him and extended a huge claw out to its full length. As he snapped at us, a smaller crab scuttled out from underneath him! We had accidentally disturbed a fall mating ritual! The angry crustacean grabbed his woman and floated back out into the waves, thoughts of murder no doubt in his mind. We did have some unwelcome visitors on the shore. Once was that most disgusting of southern insects, the palmetto bug. This moniker is clearly supposed to help you forget that you are really dealing with a giant flying roach. 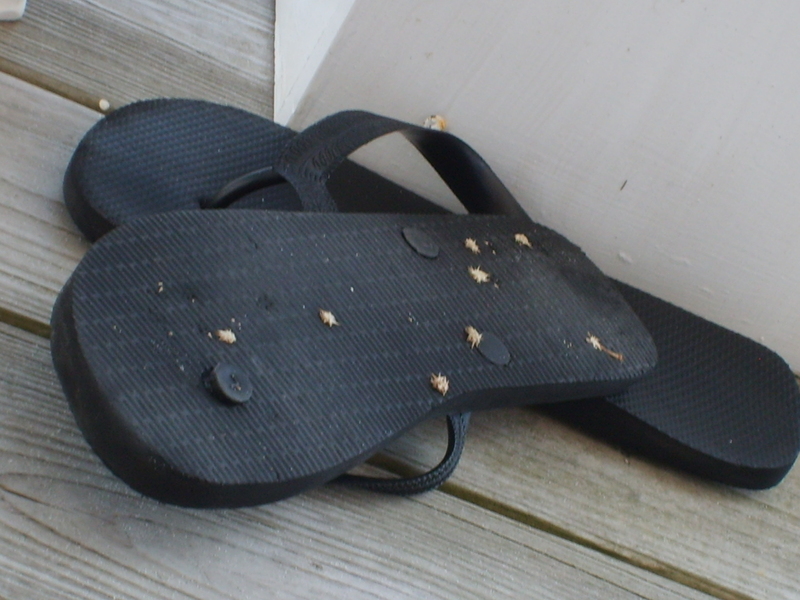 Well, I can’t forget and was repulsed by those that made their way inside our beach house! That will teach me to leave my balcony door open at night (to hear the ocean while I sleep). Eric, on the other hand, is from the Bronx and was completely undaunted. Another pest was the deer fly. These annoying bugs hang out on shore during their mating season, biting any patch of warm skin they can find. You have no idea they are on you until you feel the pain of their bites. Covering yourself head to toe in towels (and subsequently sweating to death) works as long as the deer flies can’t find an opening. They are relentless and forced me onto the porch one day. Jerks. Thankfully, they were absent the remaining days of the vacation so we could enjoy our daily swimming and sunning! Lastly, we encountered some sand burs. These aren’t a huge problem as long as you don’t go tramping around in the sea oats, but some do make their way down to the sand. Eric was annoyed to get some stuck in his feet when coming up the path back to our house. I think he thought he’d left them behind in Texas! Now imagine these ... stuck in your bare foot! Across the street from our house was a salt marsh, which is the inlet itself. My Uncle Cliff saw an alligator glide by behind some of the marsh houses; sadly I never made the same sighting. 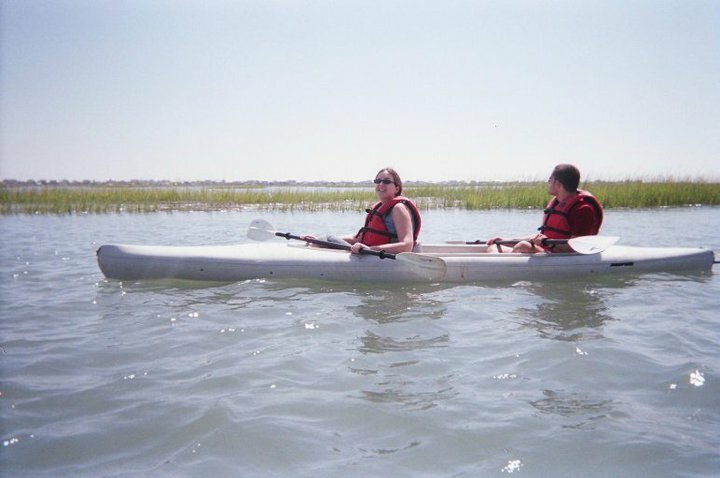 But my sister and brother-in-law had the idea to go kayaking there, and Eric and I tagged along. I had been canoeing several times and figured kayaking would be only marginally more difficult. I don’t know where I got this idea. One of the first things we did once in the water was plow into someone’s boat. But we soon got the hang of it and enjoyed a few hours steering around the marsh. It’s a very good workout! The marsh was teeming with life. Fish were jumping everywhere, including a whole school that I thought might go right in our kayak. Eric and I also witnessed an unfortunate one being fought over by a group of terns. Egrets, ducks, and herons standing in the marsh grasses were so close we could’ve touched them. The blue heron is a gorgeous bird with huge wings, which makes his raspy, throaty call all the more jarring. We also spotted a white heron with what appeared to be a much younger (but still tall in his own right) heron who didn’t know how to fly yet. 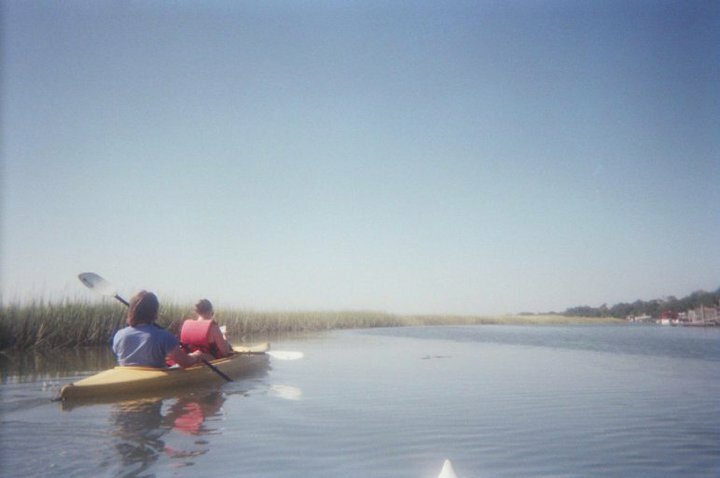 The salt marsh is home to another group of animals you might not expect: a family of goats! 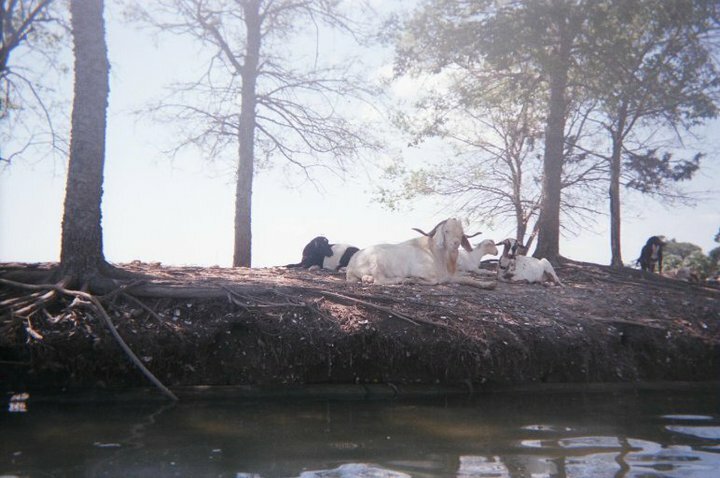 Do you remember Goat Island from my Lake Martin vacation? 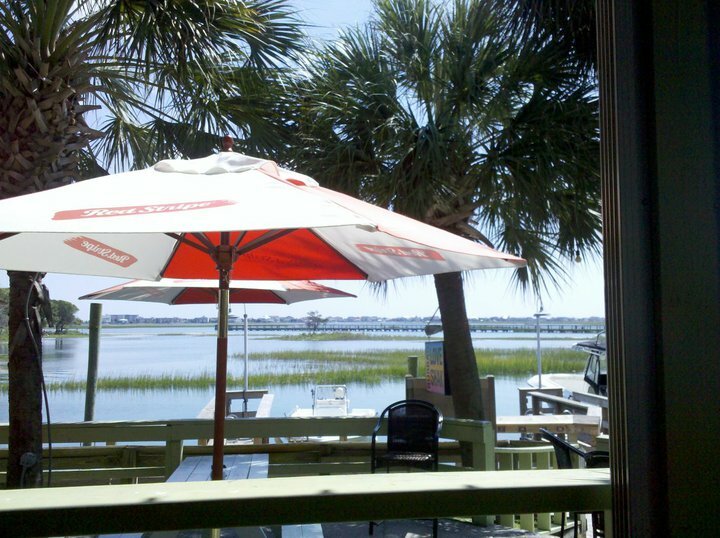 Murrells Inlet has its own. The Murrells Inlet goats are definitely well-fed. The goats are fed by a local dude named Bubba, who has his own restaurant, Bubba’s Love Shak, overlooking the marsh. I highly recommend trying the spicy Bling Bling shrimp tacos with your cocktail or beer! Bubba's Love Shak on a slow afternoon. 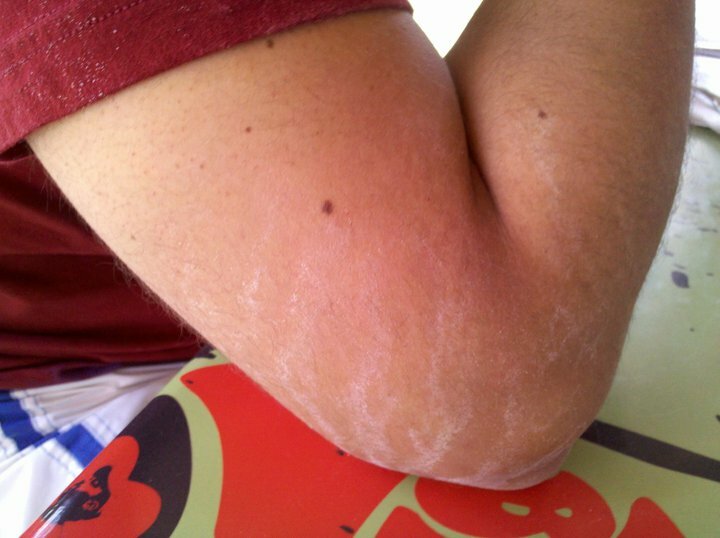 Salt water trails on Eric's arm, a souvenir from kayaking. This was so gorgeous I had to make it my new blog header! The drinks are made perfectly, and so is the food. Even the bread and butter are very savory. We ordered a slew of appetizers to pass around the table. I chose the firecracker shrimp, which comes with chipotle sauce and delectable mashed potatoes. We also had others, including onion rings (which came stuck together in a huge block), bruschetta, oysters rockefeller (a new one for me – I loved them), and oyster shooters (another new one for me). Oyster shooters are unbelievable. You get a shot glass with the oyster, tabasco sauce, vodka, and lemon and down it all at once. All of the appetizers alone were so filling and delicious that I had almost no room left for the entree: a pair of heavenly crabcakes and more of those luscious mashed potatoes. 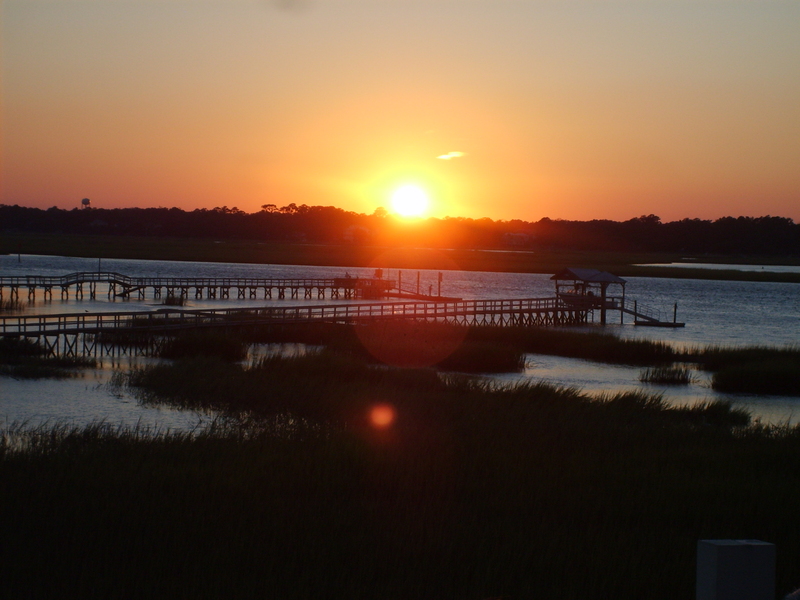 I think Murrells Inlet, and the surrounding areas of Surfside and Garden City, make up one of those places that has something for everyone. Another winning getaway! If you are interested in learning more about the wildlife and beaches of the Grand Strand area, please read Tideland Treasure by Todd Ballantine, an environmental scientist and Hilton Head resident. The book is a great read with hand-drawn illustrations, and the wring is done in Ballantine’s own hand (not typeface). I usually avoid typical chain restaurants, whether casual dining or fast food, while on vacation, unless it’s something I can’t get back at home. One of those places is Red Burrito, a Mexican fast food joint you can often find attached to a South Carolina Hardee’s. On the West coast, it’s called Green Burrito and is attached to Carl’s Jr. The Red Burrito menu is small, but you get a lot for your money. Seven bucks got me a bean and cheese burrito, warm tortilla chips, refried beans, and rice in a to-go carton.